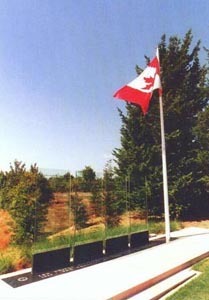 The Foundation has established and maintains a Memorial Garden, on the grounds of Le Mémorial, in Caen, France, to recall the Canadian participation in the Battle of Normandy. The Foundation has also placed a plaque in the Place de l’Ancienne Boucherie, in Caen to commemorate the liberation of the centre of the city by Canadian forces in 1944. On 9 July 1944 the 3rd Canadian Infantry Division, supported by the 2nd Canadian Armoured Brigade, launched the attack to liberate the center of Caen, which had been heavily bombed and shelled by the Allies in the previous weeks. By noon, elements of the 9th Canadian Infantry Brigade, supported by tanks of the Sherbrooke Fusilier Regiment, had reached this square and Canadian soldiers were shaking hands with jubilant citizens. By that evening the Canadians and the 3rd British Infantry Division on their left, supported by members of the French Resistance, had freed most of the shattered city. In the weeks before Caen was liberated some 3000 of its inhabitants died under Allied bombardment, and over 3500 Canadian and British soldiers had been killed our wounded by enemy action. Let us remember with gratitude the sacrifice all these men and women made for our freedom today. The CBF annually reviews the support opportunities for guide and visit programs to Le Mémorial where the story of Canadian participation in the Battle of Normandy is commemorated in the unique Canadian Garden. 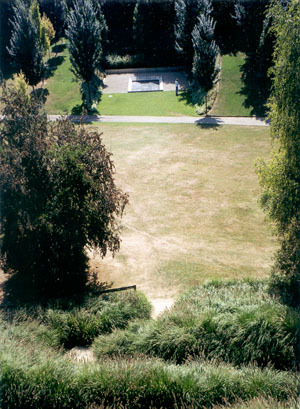 The Canadian Memorial Garden in Caen occupies a wide strip of land running across the western end of a valley, formed by a medieval quarry, which lies just to the south of Le Mémorial. From Le Mémorial visitors reach the Garden by walking a short distance along a road lined with oak trees. After entering the garden, they pass the Canadian flag flying from a mast and follow a path surrounded by cypresses to reach the edge of a stone terrace dominating the valley below. Set into the terrace on their right are four glass steles on which are recorded the names of all the Canadian military units – sea, land and air – which fought in the Battle of Normandy. Looking across the valley attention is drawn to a black slab set in a grove on the opposite slope. To reach it they descend a flight of steps on their left, coming to a path winding across the valley’s grassy floor. Looking back they see that the terrace wall, which is composed of pale-coloured Caen stone, is fissured by a vertical black granite claw, symbolizing war. A little way up the valley’s southern slope visitors arrive in the grove, composed of a circle of red maple trees, to find in the middle the black granite slab they had seen from the terrace opposite, in a rectangular pool of running water. On it they read Virgil’s words: NULLA DIES UMQUAM MEMORI VOS EXIMET AEVO (“Nothing shall ever blot you from the memory of time”). On a low stone wall at the far side of the grove, are the names of all the 122 communes in Normandy which Canadian troops liberated in 1944. The Canadian Memorial Garden is a place where nature, eternally renewing itself, is mingled with memories which should also prove eternal. It is a place to remember the young men who fought in Normandy, both those who gave their lives and those who survived. With its fissured terrace the garden’s northern slope symbolizes their descent into the turmoil of war and danger. The grove on the southern side, conceived for quiet contemplation, symbolizes the peace they won for all of us. The garden’s message for Canadians only: those Norman place names are so many reminders that the sacrifices made by our young men on their road to victory were shared by many thousands of French citizens.